Happybuy Soft Ice Cream Machine is a commercial grade unit and 5.3 to 7.4 gallons per hour or soft ice cream making capacity, that makes it ideal for use in bars, supermarkets, snack bars, fruit juice bars, bakeries, hotels, and restaurants. It is suitable for use both indoors and outdoors. As a CE certified commercial ice cream maker it conforms to health, safety and environmental standards set out by the CE (“Conformité Européene” or “European Conformity”). It has a 2200 watt power high force beater motor (110 Volts and 60Hz) with a rotate speed of 3000 r/min. It runs quietly with a noise level of fewer than 40 decibels and has a Class 1 grade electric shock resistance, high and low voltage protection and warning device. The high yield of 5.3 – 7.4 gallons per hour capacity is equal to 20 – 28 liters per hour. It freezes quickly and has a very efficient stainless steel evaporator and a very good quality global brand R410a compressor. Happybuy Soft Ice Cream Machine weighs 213 pounds and measures 21 x 28 x 31 inches, has two food grade mix hoppers with a capacity of 6 liters x 2 or 1.6 gallons x 2. You can actually create four different shapes of ice cream with this unit by using the four shape hats. 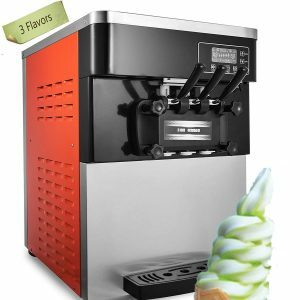 This ice cream machine can make three flavors, one mix, and two single flavors. It is very simple to clean with a single click cleaning function as you simply add some water into the hopper and press the Clean button and in under five minutes you can remove the water by pressing down the handle. There is even a removable tray and this will help avoid any mess from the dripping of ice-cream. It feels stable and safe, has a countertop design with an anti-slip base and two solid plastic hoppers. The whole process will be controlled precisely with a smart micro-computer auto control system. 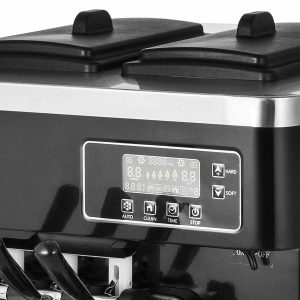 You can see and manage everything on the intuitive, informative and noticeable LED-backlit display with the Auto, Clean, Time, Stop, Hard and Soft buttons and cone counting system. You can adjust the hardness of your ice cream with this Hard Up and Soft Down buttons between 4.0 and 7.0. And the recommended hardness setting is 6.0. The cold and heat conversion efficiency is improved and a great heat dissipation is offered by the pure copper tube condenser. It has a very good quality hopper lid that helps prevent the raw material from getting contaminated. With great efficiency, quick freezing, and reliability the refrigeration system consumes low energy, saving you on your electricity bills. You can use it for both home or commercial use and the warranty will cover both. Please contact the seller via Amazon.com for a detailed warranty information.